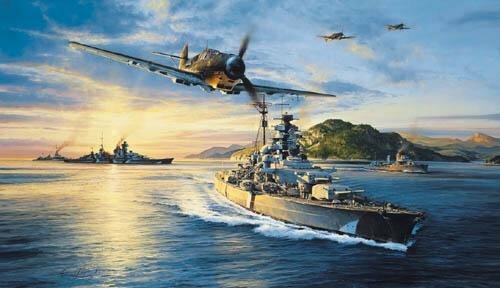 The battleship Bismarck off the coast of Norway at the start of "Operation Rheinubung". Under the watchful eye of Jagdeschwader 77’s Me 109 fighters, in company with the battlecruiser Prinz Eugen, and destroyers Hans Lody and Z23, Germany’s magnificent new battleship Bismarck is seen manoeuvring near Korsfjord Bergen on May 21, 1941. That evening, with Prinz Eugen, she will leave for Arctic waters, the Denmark Strait, the Atlantic, and destiny. Within days the pride of the German Kriegsmarine will have passed into history. Signed by Two highly respected Luftwaffe pilots who flew in the Norwegian Theatre AND a veteran survivor from the Battleship Bismarck.